One of my old exercise pals from the original crew went and had herself a baby girl. I like babies. Especially other people's babies, and let me tell you this kid is something so cute it's unreal. She was born in early December and honestly I had no extra time for baby knitting mojo. 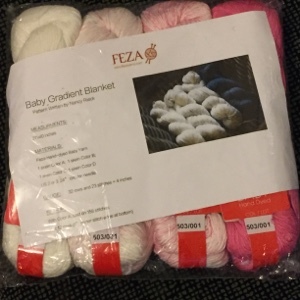 But when I saw the baby blanket kit I immediately thought of that cutie pie and well here we are. Super skinny yarn on US 3 needles. Send me some good vibes, b/c the yarn is a little splitty. Definitely requiring some bamboo and not metal needles. I've managed to make some progress since I actually took the last photo. I'm about to start color block 3/4. I'll post another photo when I get through #3. 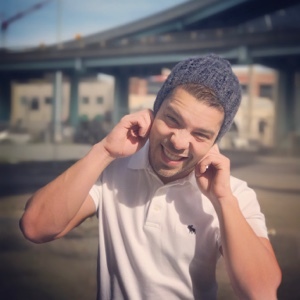 I was just beginning to day dream of pink socks and steel blue sweaters when my neighbors just announced they are having a baby boy this summer, hehe. Saturday night we woke up at 4am (technically Sunday I suppose) and whispered in the dark about our fears of the teenager and for the same teenager. Last weekend we put the Kid in lock-down to finish an assignment. I was not allowed in the room on the second day of revisions. So, I baked some bread. I baked a lot of bread. 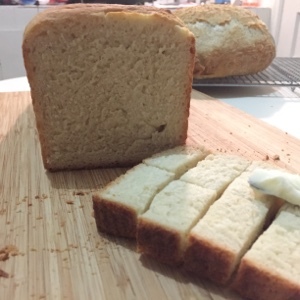 I baked some good bread and now you're going to benefit with the recipes. The bread is easy. The problem is that it takes time. 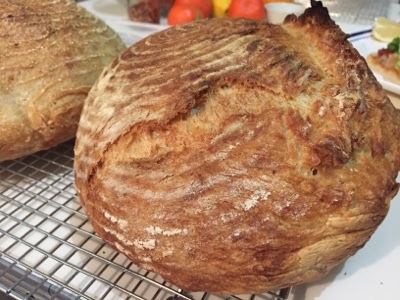 You can't be impatient with bread. You save that impatience for the know-it-all teenager whom you love and cry secret tears about when you can still see his baby face when he's sleeping. Patience and discipline is hard folks. 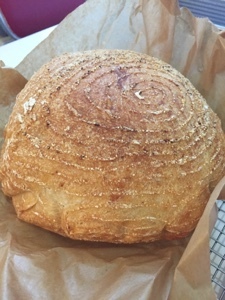 First up New York Times No Knead 12 - 18 hour rise. I baked this one exactly 30 mins. cover on and then 15 off. Notice the golden color. The boys were concerned it was not baked enough, but sliced into it was a chewy delight. Next up was the New York Times Speedy edition. More yeast, less rise. I added a tablespoon of honey because ... why not. I also baked it longer for a darker color. I gave this to my friend Luis and he seemed quite pleased. He had it for dinner with ravioli 2 days after I baked it and he said the crust was hard but it warmed up in the oven quite well. I stored it in a paper bag not wrapped in plastic. 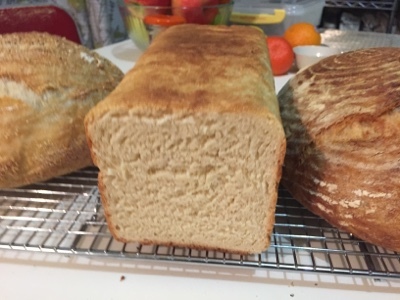 And this is my happy place, I busted out the pullman loaf pan for perfectly square Beekeeper's Pain de mie. This was the house favorite. They have had it for breakfast every morning. It's been inspiring. 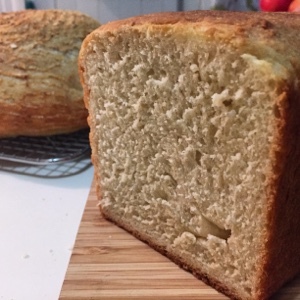 There are many pullman loaf or pain de mie recipes out there. But this one had the least odd ingredients, like potato starch or something dehydrated. 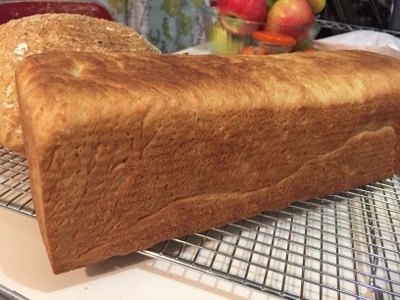 I will test a few more things out in this pan and let you know how it goes, but I love that I can make some nice tea sandwich bread from scratch. This is better than the white bread I usually make. Swoon. hearts and happiness. 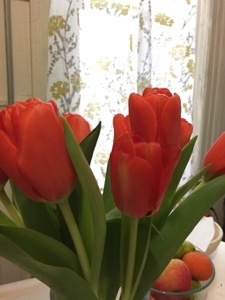 Speaking of Valentine's Day I leave you with a picture of the lovely tulips my husband brought home. We can't grow anything at our apartment and we don't buy flowers very often so this was a really sweet treat. Hope you are all well. Knitting progress next, I promise! Anyhow I believe I told you one of my dear friends, Mrs. B. brought me back 3 beautiful balls of red chunky baby alpalca yarn. It was so soft and squishy and I knew just who would appreciate a gift knit up in it. The Moms. Et me voila! 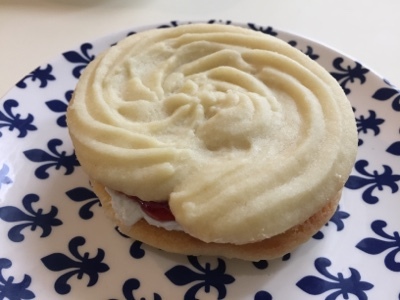 This weekend my experimental bake was Viennese Whirl Cookies or biscuits rather from the great blonde pink wearing Mary Berry. I did fuss with it because, well that's how I am. 1. I'm lazy and didn't want to make my own jam, and apparently the boys have been eating almond butter and raspberry jam for breakfast so I was out of raspberry jam which meant I had to settle for strawberry. 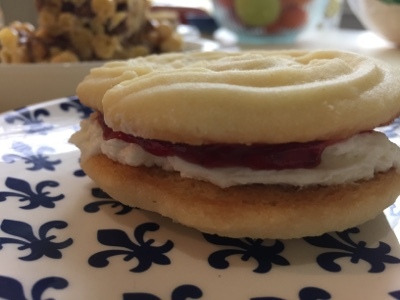 Don't get me wrong, I love strawberry jam, but for baked things we usually turn towards raspberry and apricot because it's not so sweet. 2. I also ended up doing an ermine frosting instead of buttercream because ermine is fluffy and buttercream is heavier and the cookie is so buttery as it is. Really either would work, this is a personal preference. Cookie issues: 1. The biscuit itself was bigger than I intended. 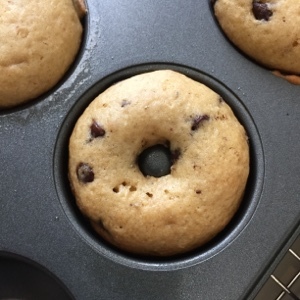 I'm not sure if when baked they spread like my @ss (too much) or if I just piped them like my @ss (too much) but they were much bigger than I anticipated. 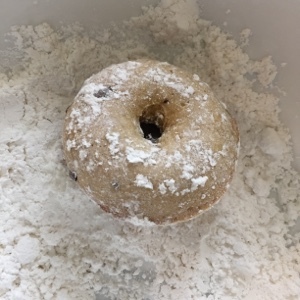 I didn't want to overbake the cookie and still found them very delicate, easy to crumble so you know, I'm not sure how much I want to do this any time soon when there are so many other sandwich cookies one can do with frosting. Though the fluffiness of the ermine frosting has me thinking more along the lines of homemade devil dogs or drugstore /hostess cupcakes (I'm looking at you Bridget). Well hopefully I'll get to that in the next month of weekends or so. Stay Crafty Kids ... you'll make yourself smile at the very least and maybe someone else too. I didn't have time to take a photo of the hat itself after I finished it but look! It's a finished knit in action. It seems to be worn in joy and that's what matters. I'm finishing up the first color and hope to get a bit into the second of four in the next week or so. 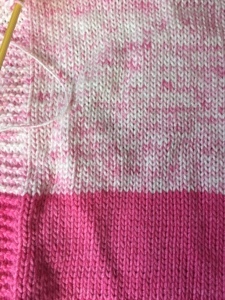 It's slow going, but it's stockinette so you know, it doesn't require a lot of brain power. As most of you know the kitchen has been going as usual. We had one of our family friend's son's stay with us for a few days last week and this was one of the items that got me a lot of praise, which as we all know is what I live for. 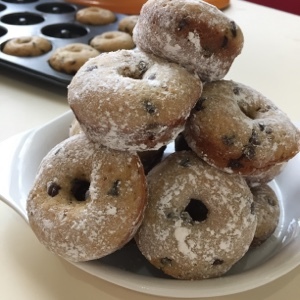 Mini chocolate chip donuts from Joy the Baker. I just want to say hi to everyone and their good hearts. 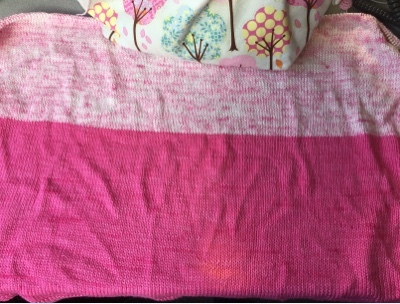 I'm sorry I haven't been around as much but I'll see you soon maybe with a little picture of the beautiful pink I'm slowly working into a baby blanket. Best and bestest to you and yours.